There is a simple practice that can improve nearly every component of leadership excellence and it doesn't require adding anything to your busy schedule. In The Mindfulness Edge, you'll discover how a subtle inner shift, called mindfulness, can transform things that you already do every day into opportunities to become a better leader. 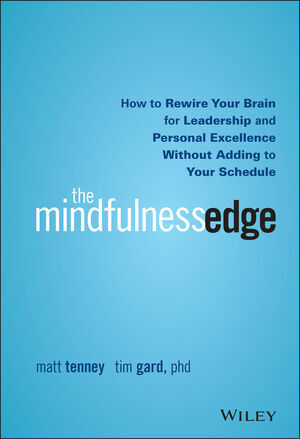 Author Matt Tenney has trained leaders around the world in the practice of mindfulness. In this book, he partners with neuroscientist Tim Gard, PhD, to offer step-by-step, practical guidance for quickly and seamlessly integrating mindfulness training into your daily life—rewiring your brain in ways that improve both the ‘hard' and ‘soft' skills of leadership. The authors make a compelling case for why mindfulness training may be the 'ultimate success habit.' In addition to helping you improve the most essential elements of highly effective leadership, mindfulness training can help you discover unconditional happiness and realize incredible meaning—professionally and personally. MATT TENNEY works to develop highly effective leaders who achieve extraordinary, long-term business outcomesand live more fulfilling livesas a result of realizing high levels of self-mastery and more effectively serving and inspiring greatness in the people around them. He is an international keynote speaker, a corporate trainer, and the author of Serve to Be Great: Leadership Lessons from a Prison, a Monastery, and a Boardroom. He has been teaching mindfulness since 2002. Matt's clients include Wells Fargo, Marriott, Keller Williams, The Four Seasons, and many other companies, associations, and universities. TIM GARD, PHD, is a neuroscientist, keynote speaker, and mindfulness trainer. His research focuses on the neural and psychological mechanisms of mindfulness in a variety of contexts. Tim is affiliated with the Lazar lab for neuroscience of mindfulness research at Massachusetts General Hospital, Harvard Medical School, Boston, MA.